Tenura Silicone Non-Slip Mats provide increased gripping power. 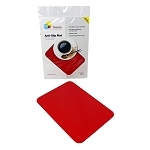 These extremely effective anti-slip pads turn dry, smooth and slippery surfaces including tables, worktops, trays, and floor surfaces, into anti-slip surfaces. Unlike other anti-slip products, Tenura is made entirely from silicone rubber, which is anti-toxic, chemically inert and does not contain phthalate plasticizers. This durable material has excellent gripping properties and can be heated in a dishwasher for cleaning and sanitizing. Long lasting Tenura anti-slip mats are more than just grippers for kitchen items. These daily living aids help people with arthritis maintain an independent lifestyle. 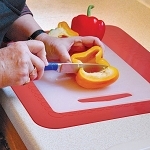 These silicone rubber mats can be used any where that needs extra anti-slip: prevent plates and bowls from sliding, hold chopping boards in position, hold kitchen appliances and mixing bowls in place. 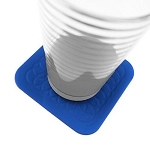 Tenura mats and coasters can also be used to place pans on to prevent burn marks on kitchen counter tops and work surfaces. Arthritis can make regular daily tasks, such as opening containers, very difficult. Tenura silicone features excellent grip efficiency to make opening jars and containers easier, ensuring that this task requires minimal effort from arthritic hands. Tenura daily living aids can be built into a system that can be used to maintain independent living for people with arthritis and impairments to the strength of their grip or limits to mobility. Tenura arthritis aids help people with arthritis when gripping items, as well as relieving pressure on painful joints. 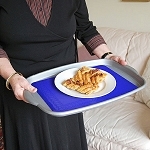 These anti-slip mats and all our daily living aids are useful to people who suffer from arthritis. All of our arthritis aids are manufactured from silicone rubber, making them non toxic, dishwasher safe, heat resistant, with great anti slip and grip properties and unbeatable comfort. 5.5 inch diameter non-slip round mat. 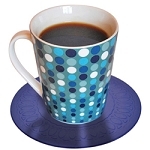 Package of 4 non-slip, non-toxic, silicone square coasters keep cups, mugs, glasses securely in place. 13.75x10 inch rectangular silicone mat.